How can I determine which onsite search terms have the highest exit rate on the search results page? This question also appeared on the Adobe Analytics message board. 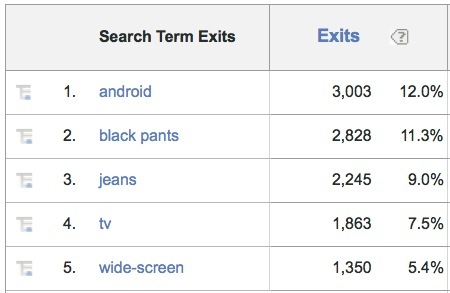 While it is easy to see how often visitors exit from your search results page, that analysis won’t show you which specific onsite search terms had higher or lower exit rates. Of course, you could pick one specific onsite search term and segment on that to see exit rates from the search results page for that term, but that is a non-scalable approach if you want to see this for multiple search terms or for all of them in descending order. So I thought I’d share some ideas on how you can tackle this type of analysis in Adobe SiteCatalyst. The first thing that comes to my mind to solve this problem is Pathing. Once pathing is enabled on an sProp, you can see entries and exits. In this case, you can pass in the onsite search term to a new Traffic Variable (sProp) on the search results page. You are probably already storing onsite search terms in an sProp so you can see search term pathing (seeing search terms used before and after other search terms). However, this sProp will be a bit different. For this sProp, all you want to know is whether they exited or not. To accomplish this, have your developers pass a value of “[did not bounce]” to the sProp if the visitor reaches any page on your website after the search results page. By passing this “dummy” value, you are ensuring that SiteCatalyst won’t see an exit if they reached a page beyond the search results page. If you see the “[did not bounce]” item, you can simply exclude that from the report using a search filter. There may be cases in which you also want to see where visitors went after seeing search results for a specific onsite search term if they did continue their path. There are a few ways to do this. One way is to build a segment that isolates visits in which the onsite search term you care about was used and then look at the path reports for that segment. A downside of this approach is that it will include paths taking place before and after the search term was used unless you use Discover (Ad Hoc Analysis). Therefore, the way I would approach this is to continue building upon the concept above, but tweak it a bit. 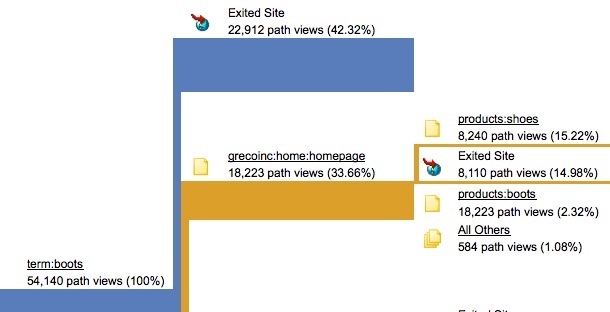 In SiteCatalyst, you can only see two levels of paths from the onsite search term, but if you have access to Discover (Ad Hoc Analysis), you can see an unlimited number of paths emanating from the onsite search term. As you can see, this version of the solution provides everything that option one provided, but also shows you the specific pages visitors viewed after each onsite search term. It is up to you to decide how much analysis you want to do and what questions you want to answer. Another side-benefit of this approach is that you can take advantage of fall-out pathing reports. Let’s say that you want to know how often visitors searching for “boots” make it to the shopping cart or to the order confirmation page. To do this, you can create a fall-out report that starts with “boots” and then add your cart and order confirmation pages to the fall-out report as checkpoints. 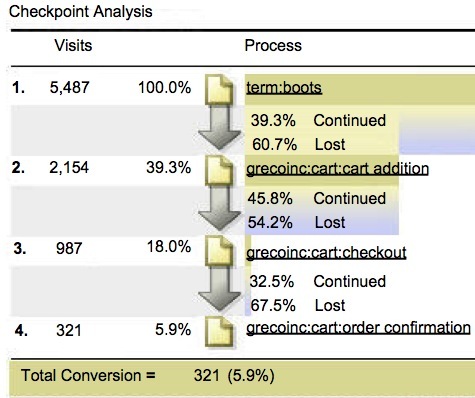 In Discover, you can even group onsite search terms into buckets using the grouping feature and do a similar fall-out report from a group of terms leading to carts or orders! I am sure there are many more ways to answer these types of questions, but for those focusing mainly on SiteCatalyst, I hope that this is helpful. This is a great solution for a very commonly asked question and yet another thing I scratch my head and wonder why Adobe doesn’t have something like this out of the box.